MILTON KEYNES, England--(BUSINESS WIRE)--According to a recent report from Strategy Analytics, worldwide sales of smart TVs reached 157 million units in 2018, representing 67% of all TVs sold during the year. 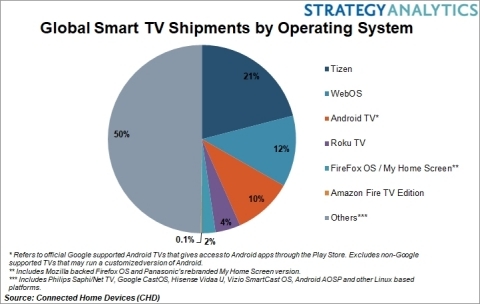 The latest research found that more than one than one in five Smart TVs sold today run on the Samsung developed Tizen platform while one in ten run on the Google managed Android TV system. Roku TV captured 4% of global TV sales in 2018 but its stronghold is in North America where nearly one in every four smart TVs sold last year was powered by Roku. Customized versions of the Android OS (AOSP) that do not combine access to Google’s Play Store are used by many Chinese TV makers for their domestic smart TV offering and account for a significant share of non-proprietary smart TV operating systems.